Every year, thousands of job opportunities are announced in Abu Dhabi for professionals as well as newbies. 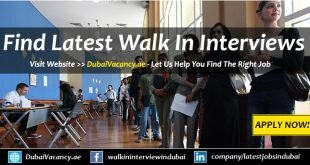 If you have also been looking for jobs in Abu Dhabi then you have visited the right place this time because you will explore a big number of such opportunities where you can apply and you can try your luck. Once you start your career in any field, you may not feel good to change it if you are satisfied enough. Therefore, it is important to be very keen at the time of choosing your career. Below you will find the best opportunities that after you very attractive pay scales and other facilities. If you want to live and work in Abu Dhabi then you should not miss the chance. Make an attractive CV to apply for all the relevant jobs where you think that you can be selected. Even if you have already been doing a job anywhere, you must apply because you should always keep on seeking for more and more, better and better. If you find these job vacancies in Abu Dhabi better than your existing job then what’s wrong to replace it! Why not to invest your time and energy in such a platform that can pay you higher.